As a new resident of the DMV (D.C., Maryland, Virginia) area, it’s easy to settle into one section of town for everything that’s needed. Grocery stores, restaurants, schools… everything is so close that most times there’s no need to venture too far away from home. 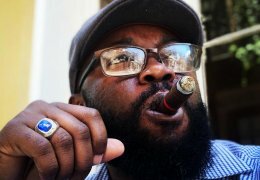 But in my quest to visit as many cigar brick and mortars as I can, I ventured north of Baltimore, MD to Harford County and the city of Bel Air, where off the beaten path lies a true gem, the Main Street Cigar & Pipe Company. 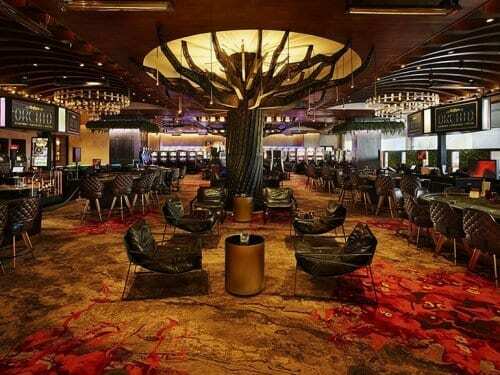 • Will the cigar selection impress? • How is the seating area? • What type of vibe will they have? • Are the employees welcoming and hospitable? 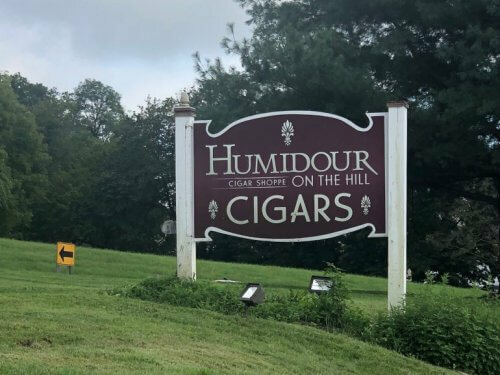 These are all things that will determine the overall cigar experience and dictate whether the trip will be a one-time deal or if it will be worth more visits. 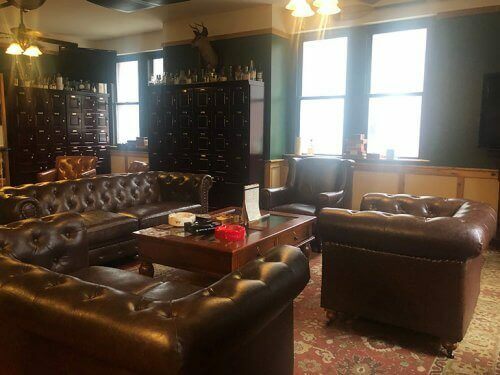 Upon entering the lobby of Main Street Cigars, I could already tell that I was in for a treat and a few hours of enjoyment. The feel was old school: wood, historic artifacts, wall-to-wall jars of tobacco and handcrafted pipes. Upon first glance, things seemed pretty ordinary. 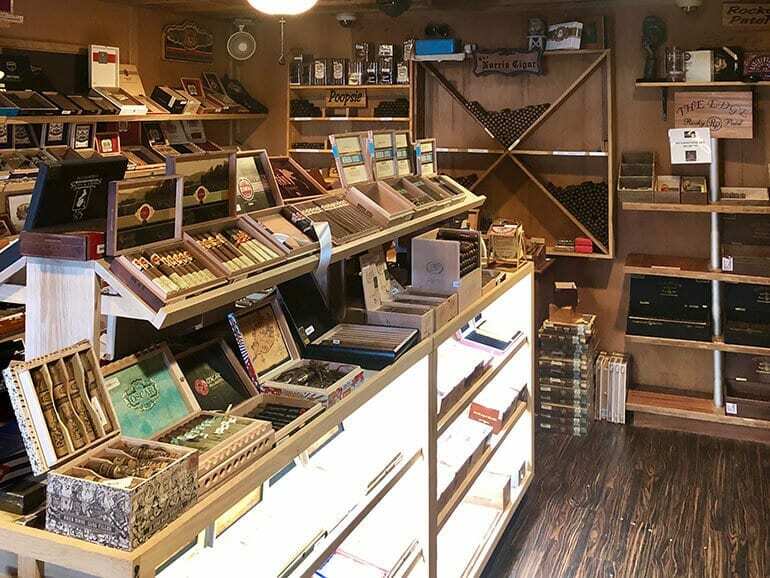 Then behind door #1, there was a walk-in humidor that would cause the heart of any premium cigar enthusiast to skip a beat. Shelf after shelf of brands that many have come to know and love, with an occasional surprise or hard to find ones sprinkled in. On the back wall of the humidor were a variety of house cigars produced by well-known manufactures, all under $6.00. The “public” lounge was adjacent to the humidor. 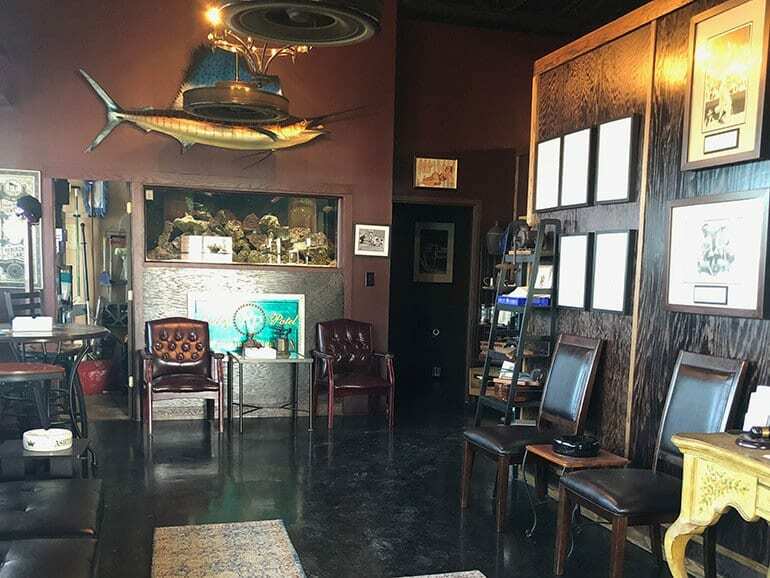 Equipped with a large flat-screen television, two rows of chairs, an in-wall fish tank, and a taxidermy marlin on the wall with a cigar in its mouth, my pilgrimage to Bel Air could’ve ended here. But wait! There was more! As I walked through the first lounge I heard the voices of patrons laughing and talking around a corner. Following the sounds of camaraderie and accord, I ventured into the “members” lounge. Everything that I had seen thus far could fit inside this one room easily. 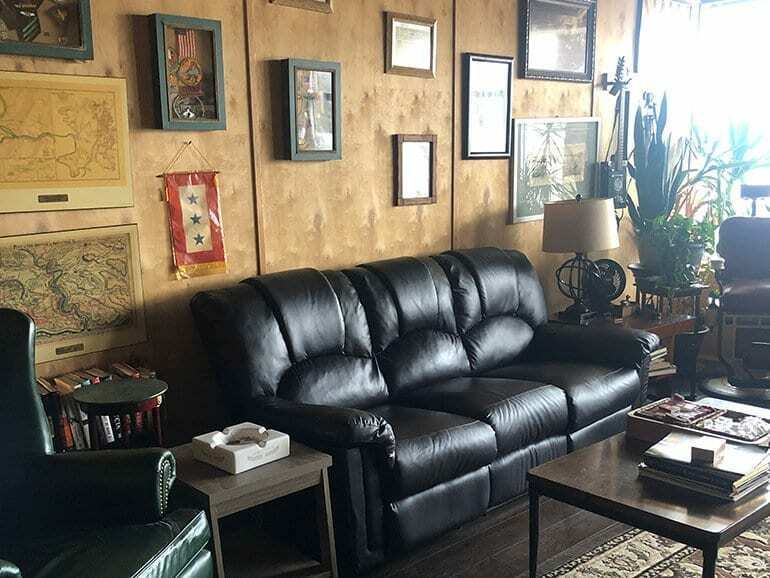 On one side of the room was a sitting area ideal for socializing: oversized leather chairs facing one another underneath a large movie/projector screen used for sporting events. On the other, two rows of the same but with a stage offering stadium-style seating similar to a movie theatre. In the back right of the large lounge was a closed door with the words “Cuban Stock Lounge” overhead. On the other side of the door is what is affectionately known as The Library (top photo), a living room styled lounge for patrons that are in a need of a quiet place to unwind, work or read. There were no TVs, no loud conversations, just peace, quiet and smoke. In the back left was yet another room, also quieter than the main but with a bar-like setup and multiple tabletops. While the venue itself was everything I needed, what stood out the most was the hospitality. In my four-hour visit I had meaningful conversations with owner Elliott Klienman, his daughter and social media manager Karen, and staff member/ambassador Anita Nickens. 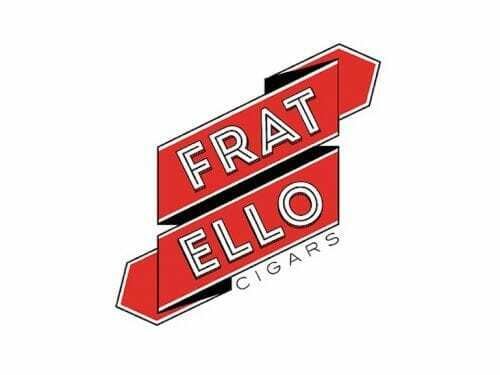 There was truly a family feel and their candor and openness with me was a breath of fresh air in the midst of aromatic cigar smoke. No one that walked in was treated like a stranger, including me, and this instant rapport will definitely take me back to this Hartford County gem time and time again. Main Street Cigar & Pipe Co.